I am not a fan of motion gaming, waggle, touch screens, or other so-called "casual controls." It's not that I write them off the moment I see them. I just have yet to see a game that uses those control options to make the experience better to gamers like me, who are well accustomed to a standard controller. 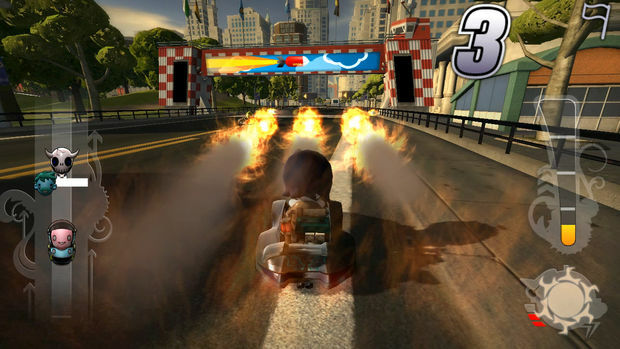 Just recently though, I saw a game that's finally change my mind, and its name is Modnation Racers: Road Trip. Using the touch screen and back touch pad of the PlayStation Vita, the team at SCE San Diego have created a game that streamlines the creation tools that we know and love while maintaining all of the depth that we expect. For those unfamiliar, Modnation Racers is a the Sony exclusive kart racer with a heavy emphasis on creation and customization. Since the series' launch last year, there have been over 2,000,000 creations available and shared, with approximately 500,000 of those being tracks. Fans of the series will be pleased to know then that Road Trip will be able to access all of those creations, day one. You can't upload Road Trip creations for use on the PlayStation 3 or PlayStation Portable, though. The experience of playing a handheld game versus a console game is distinguished most notably by the fact that handheld experiences must be quick bursts of fun that are as immediately satisfying as they are deep. For a game like Modnation, this can prove a challenge as you can conceivably spend hours building and perfecting a custom track. For Road Trip, SCE San Diego is making smart use of the PS Vita touch screen functionality to lessen the amount of time spent building from hours to mere minutes. It starts with you choosing from a preset list of environments: jungles, island resorts, deserts and the like. After that, you simply draw the shape of the track from an overhead view of the environment. Just touch down on the screen to draw and you have a track designing in literally seconds. It's that simple. From here, you can select the placement of finish lines, weapon drops, and boost pads just by selecting the option from the menu and touching the spot you want to place them at. Or you can use the auto-populate feature if you don't care to go too deep. There is also an option to use the Vita camera to make tracks out of what you've photographed. This was not demoed though, so I'm not sure how it works. Once you have a track laid out, you can manipulate the surrounding environment with touch fairly simply. So when I wanted to lay out a lake, I simply selected the option from the menu, traced onscreen the area that I wanted to place my lake in, and watched the terrain form in an effect reminiscent of From Dust. Road Trip also makes use of the back touch pad during track customization. When creating mountains for my track, I place my fingers on the back touch pad and rose the terrain with corresponding spots onscreen. When you have all the touch features working together, what you get is the ability to make complex and creative tracks in minutes. 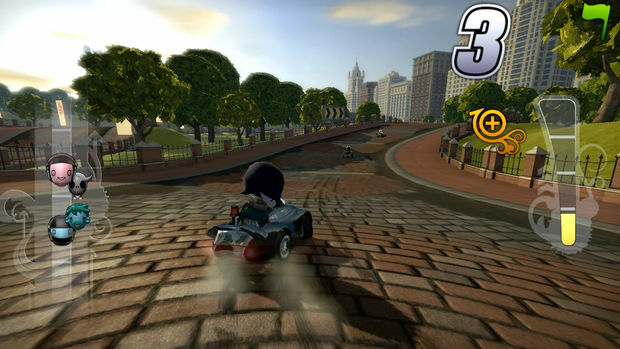 Creating tracks in Road Trip is streamlined, amazingly intuitive and easy to use all while retaining the richness and depth that the series has built its name upon. While the touch controls shine the most in the track editor, they are also featured in the avatar and kart editor. 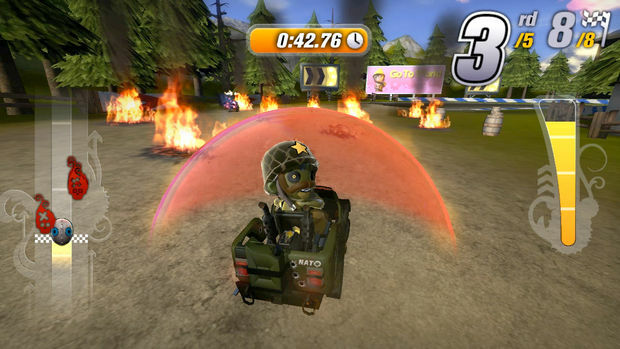 Relegated mostly to Minority Report-style drag and drop, touch in the kart editor allows you to zoom in close and swap out kart components such as tires, suspension, spoilers, etc. In the avatar editor you use the touch controls in a similar manner, swapping out clothes and accessories. One cool feature though is Modnations' use of the the Vita's gyroscope. At anytime when customization a kart or avatar, you can shake the Vita to randomize your creation. It's not the most fascinating feature ever, but it's there and it works. 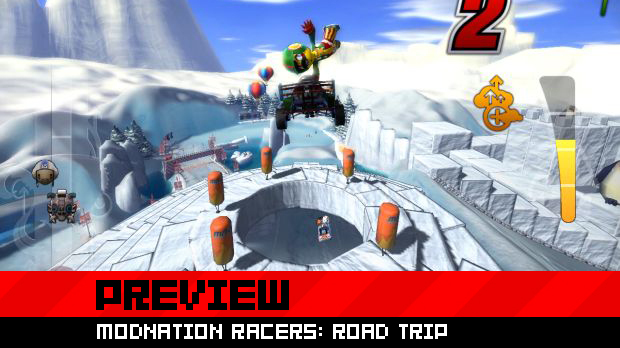 Our demo of Modnation Racers: Road Trip also showed off the game's career mode, complete with over thirty tracks and events. If you like the series' take on kart racing already then you will feel at home here. Drifting and drafting are back and intelligent use of them is as important as managing your boost, shortcuts, and weapons. As I've said, I have never been interested in the whole motion/waggle/touch control craze of late. 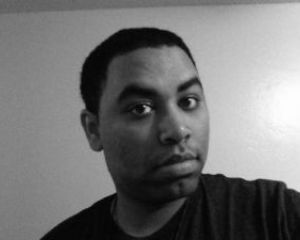 If every Kinect and Move controller suddenly vanished tomorrow, the evil leprechaun on my shoulder would probably break into a river dance. Road Trip, though, uses touch to great effect that further elevates the core gameplay of the series. Handhelds are about quick fun, and Modnation is about creating cool stuff. Road Trip's use of touch control supports both these design mantras and comes out the better for it.